This is a great video that shows a bit more of the heart and leadership of Tim Tebow. Let me know what you think. What are your thoughts of this video? 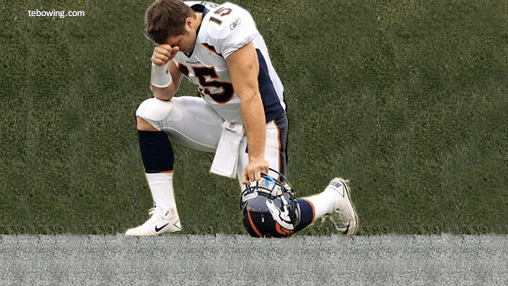 Did you hear the big controversy surrounding Denver Broncos quarterback, Tim Tebow? It was covered on the O’Reilly Factor and other major television news outlets. An arrest warrant was issued last week for failing to pay his child support- no wait, that was Terrell Owens. Was he arrested for murder, then released for being in the company of a group that stabbed a guy to death? No. That was Baltimore Ravens All Pro, Ray Lewis. Tebow wasn’t even involved in “making it rain” in a strip joint like Pacman Jones. Tim Tebow’s “controversy” is that he gives glory to God, goes down on one knee after scoring (Now called “Tebowing”), and he talks about his love for Christ publicly. It’s not that Tebow thinks that God favors the Broncos over the Titans or any other NFL team. It’s just that Tebow believes that if he is able to do anything good in this life, it’s simply because God gave him the ability to do it and he wants to always remember that. It’s actually a humble act in his mind and heart of giving God the glory. Tebow is human and like everyone, he has his faults. That is perhaps never more obvious than in his college team of choice-the Florida Gators. (If he was totally following God, he most likely would have played college ball for the Tennessee Vols but that’s another story. God has forgiven him for that.) Most likely, his deep rooted convictions will keep him on the path that many young men with sudden wealth and fame of pro sports fall victim to. Rogers went on to explain that he’s not an “over the top” kind of guy and he would rather have people ask him why he behaves the way he does rather than him telling everyone. He said this in reference to being asked about Tebow’s outspokenness. I’m not sure how well that’s working for Rogers. Before reading the ESPN quote, I actually didn’t have any idea that Rogers was a believer. His actions just aren’t speaking out to a dark world as loudly as Tim Tebow. Perhaps Rogers is making a difference with some of his teammates and quietly working behind the scenes. I know that other NFL players, such as Matt Hasselback of the Titans, are very bold in some of their relationships with teammates about their faith. There should be more grace given to anyone, be it Rogers or Tebow, if they are truly striving to be the person that God has called them to be. He has certainly blessed both men with a platform of influence and talent. Pro athletes are blessed with a lot and Scripture says that if that’s the case, a lot is expected. Tebow is trying to be the best “Tebow” that he can be, for the God who loves him. I don’t believe in throwing stones but if you’re going to be throwing them, does a 24 year old young man who is successfully being a good role model to many in this world who needs a role model need to be the target? I don’t think so.